I'm often times fascinated by the concept of decision making, no matter how inconsequential the choice may seem. Every single day of our lives we make decisions, and we must live with the results as time can never move backwards and moments can never be undone. As such we, and by we I mean everyone, are plagued by regret and we wish to have the ability to close our eyes and have the opportunity to do things differently. I would be lying if I said I have somehow completely transcended letting something like regret bother me, as it is impossible to stop the mind from wandering back to a day long since passed, a day when a decision was made that proved to lead me down the wrong path. That being said, I am a firm believer that living with a constant feeling of regret, allowing such a thing to tarnish all of life's moments going forward, would be a shame and nothing more than a waste of time. Life is too short to waste time. Cheryl begins a massive, daunting hike by choice, 1,100 miles of the Pacific Crest Trail all alone, and initially her reasons for taking on this behemoth quest are unknown to us. Through a series of flashbacks we are allowed to witness the past that haunts her and it becomes clear that she is out there in the wild as a means to escape, to get away from a painful existence that left her with so many emotional scars, but its also more than this. Every step that Cheryl takes is a small victory in hopes of finally achieving the big win, the chance to move forward with her life and leave the past behind. The chance to stop wasting so much time living with sadness and regrets. Wild does suffer a bit due to the fact that it feels familiar, utilizing a similar tone and following similar beats as films like 127 Hours and Into the Wild, but it is able to rise above this thanks to a compelling structure that keeps you wondering just what fuels Cheryl on her journey and also a curiosity as to what caused that damaged look in her eyes as she scans through unwanted memories. 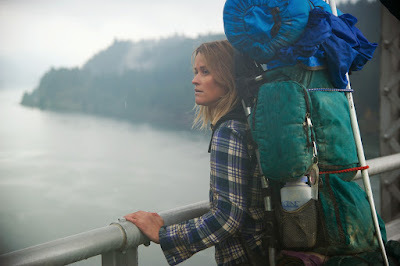 Another key to this film being successful would be the magnificent lead performance from Reese Witherspoon, as her vulnerable, haunted, and emotionally wrecked character doesn't even need words to properly demonstrate her pain. It feels so real and honest throughout, and this story simply wouldn't fly without a brilliant lead. That Oscar nomination is well deserved. By the time Wild ends, it's hard to not feel inspired to leave regrets and lingering pain behind you in hopes of moving forward. As I said before, list is too short to waste time, which is why I can recommend this film with confidence. Setting aside a couple of hours to admire a very good film featuring a great performance is absolutely time well spent.